YOU’VE GOT THE MUSIC SKILLS AND THE PASSION. NOW YOU JUST NEED A BAND. 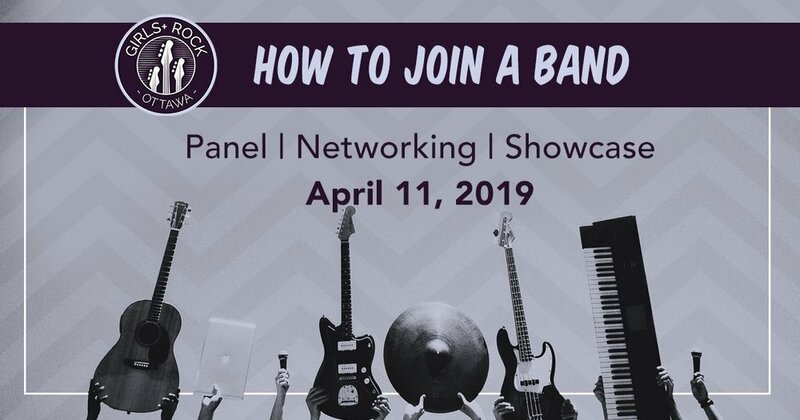 Girls+ Rock Ottawa presents ‘How to Join a Band’, an evening of music, stories, advice and speed networking to connect aspiring musicians. This one-of-a kind event will feature stories and advice from working musicians in Ottawa who can offer insights into building a band and the importance of elevating underrepresented voices. The panel talk will be followed by a speed networking session where you might find people to form your very own band with! The National Arts Centre is fully accessible. Organizers acknowledge that this program takes place on unceded Algonquin territory. This program is open to girls, women, femmes, trans, non-binary, two-spirit, and gender non-conforming folk ages 13+. Kimberly Sunstrum is a heart-stopping performer. Her songwriting is deep, evocative, and powerful; her music delightfully impossible to pin down. It’s an inspired blend of the grooves she listened to growing up in Sub-Saharan Africa and Canada. Kimberly writes about the world as she sees it with a powerful poetry and grace. Mixed-race identity, feminism, love, family, and queerness are reflections of her life and constant themes in her songs. Her enigmatic passion pours out of her with every single performance leaving audiences feeling energized and excited. A well-established and respected musician, Sunstrum has been nominated for the Colleen Peterson Songwriting Award, performed in notable festivals such as Westfest, RBC Bluesfest, as well as Ottawa Capital Pride. Salmon Ella is a result of the 2017 Girls+ Rock Ottawa’s Rock Camp for Women+. Since that June weekend, Cynthia, Dani, Hannah, and Katie have been writing music with quirky melodies and uncomfortably honest lyrics to get to the heart of their experiences. Influenced by Warpaint, Bikini Kill, Courtney Barnett, and Fiona Apple, they played their first show in October 2018 and are quickly making a mark on the Ottawa music scene. Sometimes absurd, sometimes ethereal, their music will have you saying “I don’t know what I just listened to, but I think I liked it!”. Kira Montfort is an Ottawa-based professional musician with nearly two decades of experience playing in bands and collaborating with songwriters. A prolific musician, Kira has toured through Ontario, Quebec and the United States, supporting bands with percussion as well as guitar, bass and back-up vocals. She has also been in high demand for live performance and studio work. Kira can be heard on dozens of records including releases by Sleepy and the Noise, Jennifer Potter and Sarah Howard. Recent live performances include Ottawa Bluesfest, Capital Pride and Megaphono. Kira completed a Bachelor of Music degree in drum set performance from Carleton University. Liz Clarke a.k.a HTEBASIŁÉ (pronounced hita-basee-lay) is a Toronto and Ottawa-based poet and rapper. She traverses the neo-soul and hip hop scene with a sound that empowers and inspires. As a black Canadian woman, she embraces all the ways her existence defies conventional limitations and expectations. Her music reflects her daring and fiery light that navigates life’s turbulence while inciting joy and reviving dormant passions.